Thursday was day 3 of this year’s workshop and festival. Our lunch time concert featured some innovative arrangements featuring the music of Rob Kohler with the Infinitus String Trio. Len Aruliah and Jared also joined in for this concert. Our Thursday night Jam at Petra’s was wonderful. We enjoyed a warm summer evening here on the westcoast, and large number of our workshop students participated in the performance. Over 100 people attended throughout the evening and heard some great live jazz from our workshop students. At noon today (Friday July 9th) we feature Alan Matheson with our workshop faculty. 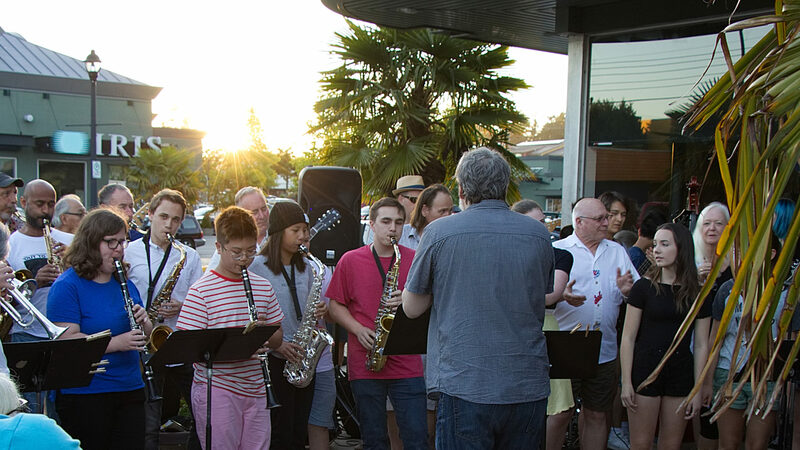 He has worked with a variety of local groups including the Vancouver Symphony, Vancouver Opera orchestra and Fred Stride’s Big Band, and is the leader of his own big band, nonet and septet. Mr. Matheson studied with Vincent Cichowicz and has performed with such renowned artists as Clark Terry, Phil Woods and Louis Bellson. His compositions and arrangements have been performed by Martin Hackleman, Julia Nolan and Clark Terry. He has also been featured on C.B.C. Radio, and at the Montréal, Paris and Tartu (Estonia) Jazz Festivals. Mr. Matheson has also recorded a CD titled Intrada. Matheson has taught at the Otava, Finland Jazz Camp (2008). On Friday evening the Len Aruliah Quartet performs at the All Saints Anglican Church. Admission is $10 at the door.